Perfect to conveniently hang coats, hats or dorm backpacks to grab on your way out the door to class! Dorm Co. Tip: Take advantage of convenient over the door storage space to store bulky coats! Part of staying stress free in college is adding simple dorm organizers to your college dorm room. An area that will provide convenient dorm room storage that you should take advantage of is the area over your dorm room door! Putting up over the door dorm room organizers will keep dorm items you use a lot organized and in a convenient area. Our Dorm Over The Door Hooks in Turquoise come in a pack of two so that you can keep both your coat or sweatshirt and your college backpack right over your door where you can grab them on your way to class. 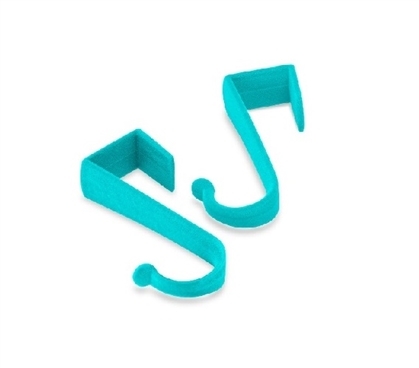 Our Dorm Over The Door Hooks in Turquoise fit securely over your dorm room door or dorm closet door and are coated in a velvet resin with bright turquoise color to add a bright pop of color to your dorm room decor. These Dorm Over The Door Hooks in Turquoise will keep your dorm essentials you need every day for class in a convenient area where you can grab them as you walk out the door. It's awful to forget your sweatshirt and shiver in that cold classroom the entire time or worse- forgetting your college backpack! Don't forget those things anymore with our Dorm Over The Door Hooks in Turquoise. When these college supplies are placed over your dorm door, it will be hard to forget them when you look at them as you walk out your dorm door to class!